Default Value The User Selected is added automatically when creating a new record. The Users Type will determine which type of Users will be available in the list. Regular Users - Only Regular Users will be available in the list. Lite Users - Only Lite Users will be available in the list. All Users - All Users will be available in the list. 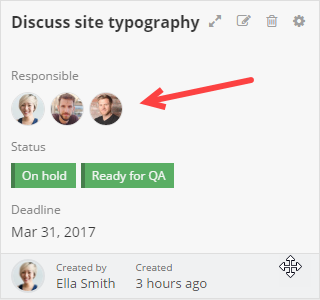 When ticked, all selected Users will follow the record in context. For example, if you create a new task and set John Doe as Responsible, whenever that task is updated John Doe will automatically be notified. When unticked, Users will need to manually follow a particular record if they want to be notified when it's updated. Allow multiple choice? When ticked, the user can select multiple values (Users). When unticked, the user can only select a single value from the Users list. 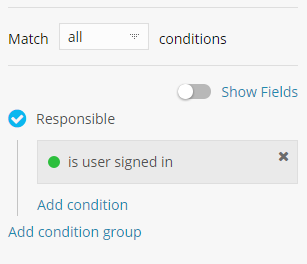 In a Tasks App there is a Link to User Field named Responsible.